Ratings are averaged based on 201 reviews. Stayed here many times now. Overall good hotel in a great beachfront location. Overall the resort was great, we really enjoyed the pools and the location. The only issue was the two bedroom units are a long way from the pools- I would recommend families choose interconnected rooms rather than 2 bedroom. If going to Bali again I would stay here again. Bathrooms tired and could definitely do with a makeover. While hotel is old and a little tired, it offers brilliant value for money. The location is absolutely perfect. The only negative is that the hotel does not have enough pool lounges to cater to the number of guests. Plenty of space to put more out, but perhaps just a case of they don't own enough of them. Is annoying when you want a swim after being out and about, however have no where to put your towel and belongings. Excellent location and good atmosphere around the pool. Rooms need updating and could do with a pest spray. Food was good and so were the $5 daily cocktails. Great value for money. Fantastic facilities and location. Good service. Would recommend and come again! Great location. We stayed with 2 children. Was great. Would stay there again. They are currently upgrading rooms so once that is finished it will be even better. Many little things made this inadequate, like the quality and quantity of the toilet paper, the lattice door in the bathroom and lots of other things that need repair. However the staff were very helpful and the gardens and surrounds totally delightful. Perfect location for families. Close to everything. Staff are friendly. Food is good.. lots of entertainment. Very basic rooms. Rooms in need of refurbishment which is currently on going. Air cons barely cooled. Location awesome as is the pool. Few sun beds around the pool some without cushions, because of this people saved a seat at breakfast and held it all day. Recommend rooms near to pool and beach. Staff Are friendly saying hello when they see you, the room we stayed in which was the deluxe room was outdated, bathroom hot water only trickled out of the taps, had to change rooms due to the 1st room having no hot water, bathroom was outdated and has the sealant coming off around the tiles in the shower/ bath. Room was serviced daily. Buffet breakfast was ok but dinner wasn't the best. Good location to the beach and neighbouring restaurants. Room was very 'tired'. No iron or hairdryer. Toilet was clean inside but the outside was filthy! Beautiful historical hotel in a prime location of Legian. Staff were lovely and very obliging. Good location close to beach, bars, restaurants and shopping strip. Hotel a bit dated but was in middle of renovations during our visit. Comfortable stay but have stayed in better. The Jayakarta is perfect for all ages. rooms are a little old but very clean, pool area is fantastic and if you cant get a spot around the pool just a few steps and your at the beach. Staff are always friendly and helpful. I a cant wait to get back there. Highly recommend. Beautiful place, lovely people, room needed some work, things were falling apart and were broken. Reasonable value for money, great pool options and friendly staff. The Jayakata Bali is a little out dated. We stayed there 26 years ago and the place hasn't changed. Very easy access to the beach and shops plus the Jayakata runs a free shuttle in to Kuta several times a day which is useful. We noticed that many things were looking very worn out / broken and in need of replacement / repair. Also had an issue with a tepid shower (very little hot water coming through), we asked this be addressed and it wasn't. Overall though it was very clean, the staff are friendly and the gardens are spacious which is really nice when so many other resorts don't have much land. Food of night wasnt nice . Breakfast menu could do with a few more varities. Otherwise Were happy to stay again . People friendly and close to everything . Jayakarta is great but the food and drinks are far too expensive inside the hotel. Fantastic place to stay. Loved it. Going back again. Great hotel, great location, fantastic staff & service and great ambiance...would highly recommend to anyone wanting a truly memorable Balinese experience in beautiful open surrounds and wonderful staff...if you are looking for an international 5 star fully enclosed air-conditioned sanitised cocoon - don't book! Have stayed here before lovey gardens lovey staff only let down is no safe in the rooms found this quite inconvenient haven't come across this in any other resort we've stayed at..
Great hotel in a faboulous location.Hotel is celebrating 34 years this year.It is a traditonal Bali hotel set in lovely landscaped gardens with 3 faboulous pools.The rooms are slowly being renovated. Some rooms are a little tired but value for money and location plus breakfast included out weighs this for me.Hotel backs onto beach as well which is another plus.Staff are very friendly and lots of restaurants etc close by.We would definately stay here again this was our 4th stay here.Don't expect 5 star for this property as it is not 5 star price.If you want 5 star plus stay at the Bali Padma.The grounds are a lovely oasis away from it all. Great value, perfect position and friendly staff. Will be back!! Pleasant stay, breakfast options could have been better (juices & cereals were both sugared, no natural versions available), better variety / change of fruit would have made experience better (did not change at all for the seven days). It was alright, good stay for families but I would recommend for couples and room is a bit oldish. Although, this was only my second time in Bali and the first hotel I stayed at was really flashy so maybe that's why the rooms felt old to me. Our room towels were forgotten twice , the room lights kept flickering throughout the night , people should be seated at breakfast not hang around waiting and then someone walks in and swoops in FRUSTATING and causes confrontation . The hotel can do with upgrading. Location awesome to all our favourite markets, restaurants, sunset bars. They need more sun beds and umbrellas around pool - not enough! Breakfast is ok but wouldnt eat lunch or dinner at Jayakarta. So many awesome food options all around. Jayakarta overall is ok for the money, rooms def need a freshen up. Rooms pretty basic, need a little tlc. One power socket in bathroom is really inconvenient when two people are trying to charge phone/iPad. No hairdryer in room, have to ask, and they're pretty poor. Staff are all friendly, location is great. Jayakarta is in a great position for Restaurants, shopping, sunset drinks. The hotel staff where all very friendly and professional from beginning of our stay till the end. The hotel is getting a bit tired. They are upgrading the pool area so that should be good when finished. The rooms are getting a bit rundown though. The Jayakarta is a large hotel. It is older so a little run down in places. I enjoyed my stay as i love the location right on the beach and its close to my favourite restaurant! The staff were friendly and helpful. No safe in the rooms- they had another option for this though i chose not to use it. I could see this hotel being great for kids. The pools are large and they have a playground with swings. For the cheap price i was happy with my stay! Fairly good all round. Very good breakfasts. Service was excellent. The room was good except for the bathroom. It needs renovating. The staff were very freindly, also very happy to help with any request. Location was great, not far from various shops , great restaurants and bars. Taxis and scooters are available just out side of the compound, and mini mart and an atm just over the road. We will be staying again and again. Rooms are quite old and in need of some modern upgrades. The TV's and small fridge are well outdated and bordering on useless. These are relatively cheap items to replace. Great place to stay. Brilliant location. Rooms a bit older but clean and comfy. Excellent value for money. Have stayed in many hotels in Legian but keep going back to Jayakarta as the location and setting is hard to beat. Good location. American Breakfast includes Indonesian with a variety of choices. Pleasant stay, close to Seminyak for good shopping. We really enjoyed our stay here it is good value for money. Located right near the beach great for a beer a massage and daily sunsets. The staff were great rooms were clean and within walking distance to double 6 beach, garlic lane and great eats. Highly recommended! Rooms are quite dated but the grounds are lovely and over the road from beach. Great location for us as we have friends in the area and always feels like we are going home. Cant wait to stay there again! Yes, the Jayakarta needs a renovation but you need to keep in mind its a much older hotel. The location is amazing! We stayed with a group of 8 adults. Two couples requested to move rooms due to being given single beds and the staff were more then happy to accommodate this. We were apprehensive about staying there after ready LOTS of bad reviews on the Jayakarta but its clearly whinging Aussies making them who want more then they are willing to pay for. The staff, service and resort grounds were great! The staff were always friendly, welcoming and helpful. The resort grounds were beautiful and impeccably maintained. The rooms however need refurbishment. They are very tired and dated. Maintenance in the bathrooms needs to be addressed sooner rather then later. The staff were very friendly and helpful and the resort itself is in a great location. The rooms are a little dated, but they are clean and well maintained everyday. I would have no problem coming back to the Jayakarta. We had a wonderful time, could not fault the hotel. The hotel surprised my daughter (and us) with a birthday cake, fruit and flowers on her birthday. It was really lovely. Rooms a bit dated but read the coments - room staff fantastic, pools great,gardens well looked after. We arrived late at night and was put in a shocker of a room, which was supposed to be a duluxe room, with a balcony however it was on the ground floor and the shower drain stunk and was blocked and the smell soon took over the room. You couldn't go out on the patio because everyone's split system air con. was on our patio, blowing hot air on you. The next day my wife asked to move to another room and staff was a bit hesitant but my wife was persistent and we got moved to a better room, with a balcony, however rooms are a bit dated. The grounds and pools are excellent, but if you drink beer it is $6 for a bintang where most places were $2.50 to $3.50. The resort is as boring as you can get and at night its even worse. It was like a ghost town after about 9:30pm. We ate at the restaurant a couple of times at night but you could get a lot better elsewhere. I am 49 years old and travelled with my wife and another couple around same age. It is a good place to take the kids or if you just want a relaxing holiday, but lacking atmosphere for adults who want fun. Room need a refurb, but was comfortable. Was hard to get a chair to lay by the pool, people saving them from dawn and sometimes not even coming back to use them. Great value holiday for families. Service is a little unfriendly at times in the restaurant in particular at breakfast. Pool area great. Our room was not large...but very nice. It has 2 pools, one for quiet and relaxation. ..the other for younger. Breakfast was included and loved the variety. The drinks were cheaper from the little stall near back entrance ???? Bit disppointed we are asked for connecting rooms like the year before we had to climb strairs which was rather difficult ..
All staff were fantastic but the staff at the front desk are your No1 people they make you feel comfortable and they understand all requests that is asked of them. I would definitely recommend this hotel for the location, pools & friendly staff. I have already planned to stay in this hotel for my next holiday! We have been going to Bali for the last 6 years. Always stay at the jayakarta very relaxing, great breakfast and the staff are always friendly and accommodating. Great amnesties and good rooms with tranquil garden views. I got the room I requested, and was given a beautuful fruit and flower arrangement, with Welcome Back written on it. The hotel has been freshened up and is looking clean and beautiful. The staff are very efficient, friendly and extremely helpful in all areas. They made our stay in Bali a great experience once again. Will be back next year. Even though we only stayed at the Jayakarta for two nights i would certainly stay there again, great facilities & an even better location. So close to the main street, restaurants & right on the beach. Will definitely be back in the future. We just love it here the location the open space pool areas and surrounds! 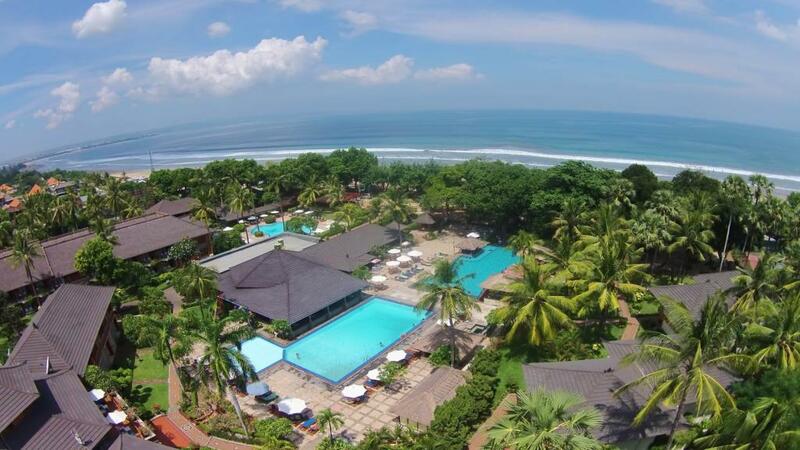 The Jayakarta Resort is in a great location right on Legian beach and set in lush surrounds. The rooms are a good size and the service was very good. The daily breakfasts are terrific with something for everyone. The only let down is that the property isn't being maintained. Some of the airconditioners are not effective and opening a window is not an option. The bathrooms need an update and general maintenance needs to be undertaken (our wardrobe door was hanging by one hinge). That said, the rooms are spacious and the beds very comfortable. We have stayed here a couple of times and it is value for money. WiFi has improved in the last 12 months. Beautiful gardens and found the hotel and service to be ok.
Great Location. Rooms & Service were Average. Location is fantastic. Close to beach, shopping and dining. Breakfast was very good. A typical buffet with a good selection. Check in & Check out were both very good. Pool area is very nice but can be a little crowded. Gardens are beautiful and very well maintained. The bed in our room was comfortable. The room we stayed in was a Deluxe. The room was quite dated with the bathroom being a very dark. The room was not really cleaned during our 7 night stay. The room cleaning staff did not replace towels, water, and toiletries. We had to go to reception nearly every day to get these items replaced which was disappointing. In saying all that I believe the Jayakarta is very good value for money. A great location in a family friendly resort. The Jayakarta is in a great location for shopping and dining, as well as beach front access, set in beautiful established gardens. The resort is old in original condition, originally opened in 1983. The rooms are large and comfortable enough. We had the interconnecting option for the children and that worked well. The breakfast and meal options were all very good, the service was also reasonable albeit moving on Bali time. However this resort is in original condition so while it is well maintained and clean, it is well past a major overhaul. The room cleaning also a little patchy with hand towels some days and not others etc. I would recommend for families and there would be few disappointments. Note also immediately outside the hotel gate there are several laundry services where you drop and collect the next day. 2-3 kgs of washing done for $4. Seriously! Would stay at this hotel again. A fairly old hotel but still quite charming. Need quite a few more staff to service the size of the hotel especially the pool area. Access to the beach is great which gives an added cultural experience by sitting out on the beach with the locals selling their wares and food and drink. We requested inter-connecting rooms as we have young children and they did not give us inter-connecting rooms. We had to go back to them and sort out inter-connecting rooms. Other family members on holidays with us had the same problem. The rooms were very spacious and comfortable but smelt damp and mouldy. Could do with a bit of work! The pools are lovely but the paving around the pools really needs some attention. It is very slippery and quite dangerous. We saw lots of people slip over, including myself and my children (though walking with caution). The price is reasonable for what you get, and the location is great! It's a perfect holiday hangout with everything at the doorstep,really enjoyed the delicious traditional Balinese food with traditional ambiance of the place and 3 swimming pools is a bonus,however the rooms are bit outdated but the staff were really nice and helpful,it's a place I would want to visit again. Really enjoyed our stay at Jayakarta. Great position and lovely hotel. Had no problems and would recommend to all. Great hotel for families. Nice friendly welcoming place to stay. Rooms are a bit dated also asked for queen bed in one room and the just pushed 2 singles together made as 2 singles. Around the pool very slippery seen multiple people slip over every day. My holiday was fantastic, we were a large family group of all ages, the location of Jayakarta was excellent. Close to shopping, massage, transport and of course the beach bars are straight out the front along with a large choice of very reasonably priced restaurants. Would stay again. After the first night it quickly became apparent that the food was terrible and the cost for food and drinks were excessive by Bali standards. We were forced to dine elsewhere. There are a lack of facilities for young children and what there are was either dangerous for kids or cost too much with the exception of the pools of which there are three. If we were not meeting family there we would not have stayed. I booked two rooms for our visit to jayakarta. One was a deluxe room, although cheaper in price it was located in what seemed the more recently renovated section. Although smaller this had a nicer room and a nice reception area (along with better service). The apartment rooms are located away from the beach and pool area. The reception area is small and dated, staff speak little English and the service was poor. Even when checking out after waiting for 30min for the bell boy I had to make 3 trips up and down carrying my own bags. You can also hear the bar across the street from the apartment rooms. The experience in the apartments was extremely different to that of those in the deluxe rooms. The pool area is great as is the location. Would I stay again...prob not. A great position traditional style resort with well kelp gardens and pool areas. The rooms are very comforatble and the service overall is excellent. I would recommend this resort to anyone. It definitely ticks all our boxes and is great value for money. Rooms are a little dated but would stay here again, amazing breakfast, staff and pool! Fantastic location!! It is a great resort , beautiful gardens and surroundings , 3 magnificent pools and a great location to beach and nearby streets for shopping , eating and just going to the pub. Love it there. Right on the beach, plenty of restaurants close by. Huge resort with everything. 3 pools, swim up bar, free breakfast, wood fired pizza and even corn on the cob. Plenty of trees for shade and the proximity to the beach keeps the temperature lower than resorts further away. Two steps out the front is the beach with plenty of beach bars and a beach cafe selling the freshest food to wash down the Bintangs. Within 200m of the beach entrance are about 10 restaurants, Italian, mexican, seafood, whatever you want. The rooms are fairly old and could do with renovation but the price is great for the position and the aircon is cold. Great place, friendly staff, good clean and tidy... gardens are a treat!!! Great value for money, great service, great food!! Would recommend Jayakarta Hotel and would definitely stay there again! Great location and beautifully maintained Resort. Rooms are a bit dated but with breakfast and the pools, it's pretty good value for the money you spend. I have stayed here 9 times out of the 10 times I have been to Bali! I love the location I love how big and open it is and love the shopping and restaurants that surround it! The rooms are very Balinese and probably could do with a refurb but then I guess the price would increase and I think it very reasonable and really you only sleep in them! The Jayakarta has the best breakfasts ever, the cleanest rooms ever, the best area ever. The resteraunt would be good if they did not charge so much tax. Food is lovely. The Bintang price is extortionate ? I booked a poolside room, which would have been lovely if there had been net curtains up, so that I could have our heavy curtains open for the pool view .. As it was the people walking past our room would have a room view..
We have been there the same weeks for two years, with cold water both times, I did complain this year , the third time we did get some warm water.. The wi fi drops out a fair bit.. But after all that.. I enjoyed my stay..
Bali the place that has everything for everyone! Staff very friendly and helpful, nice clean rooms although did have to change so check before unpacking..beautiful pools and gardens (swim up pool bar really needs a facelift).. just really needs a makeover, pool area have to be careful of cracked tiles and very slippery, bathrooms also. Great location close to lovely restaurants and bars and great shopping. Great for families and couples. Had a great time!! This hotel is great for everyone. Its location is great whether you want to go for a walk or grab a cab. Dining options are fantastic around the hotel. The Jayakarta's food options weren't great but the hotel is surrounded by some fantastic restaurants so this wasn't a major issue. The rooms are clean and a good size and all of the pools and grounds are well maintained. Great option for families and groups. Though this hotel is not 5 or 6 star, the position suits us being between Kuta and Seminyak. The property is fantastic with expansive pools and gardens. Staff are pleasant and hotel is situated just across from the beach where one can meet many and varied characters offering drinks and other goods for sale or wander along the road for good quality restaurants nearby. But do sit on the beach and watch the glorious Bali sunset while sipping a Bintang.!! Staff friendly and helpful.Position great.Breakfast fantastic .Free shuttle to Kuta 4 times a day convenient.Rooms a bit dated but I think value for price. Wonderful hotel to stay at. The service was great, the facilities were well maintained, free shuttle bus & it was in a great location. Definitely stay there again! We had a pleasant stay at the JB. Our rooms were clean and nicely presented as well as the wider gardens and the 3 pool area. Breakfast was very good with lots of choice. We dined at the hotel restaurant on a Wednesday night as it was BBQ night and only $12.50 for all you can eat. Drinks were slightly expensive except for Tuesday & Friday happy hours where it was almost given away. Legian is relatively quiet but the hotel offered a free shuttle bus to Kuta every 2 hours. In all, the JB was very good value and not too far from most places of interest. I'd probably book again. Great location, Fantastic helpful staff, Close to everything. Just spent 9 nights at The Jayakarta Hotel. Was upgraded to a 1 bed apartment. Located at the front of the property away from the noise of the pool(kids/drunk Aussies), opposite a great massage shop, mini mart, laundry and many restaurants. Beach at the back of the hotel. Rooms are tired and need updating. But staff and service top notch. Will be back with the kids next year.???????? The Jayakarta resort is located right on the beach at Legian, with a number of great restaurants just a short stroll away. Whilst the rooms are quite tired and in need of a makeover, the grounds are filled with lush tropical gardens and 3 lovely pool areas. I would recommend the Jayakarta to any budget conscious travellers who are ok with a more "no-frills" type resort. This was our second stay here. Everything you need. Older, but clean, spacious and excellent value. A nice stay with my family. The Jayakarta Hotel in Legian/Seminyak is very stylish, clean and quite beautiful. Outstanding grounds and gardens, great pools, wide range of choices within the hotel from breakfast through to activities on offer. I went with my wife and 8 year old daughter who both loved the place. My only complaint was it was basically to big. Too many people, thus lines for breakfast and difficulty in locating a table, slim (if any) chance of getting a deckchair by the pool. The staff were great but with so many guests, they would have to be Stephen Hawkings to remember half the guests names. This takes away from the personalised holiday I have usually enjoyed in Bali. However, I would have no hesitation in recommending the Jayakarta to future guests. Great location, staff friendly rooms very old and in need of an update. Good value for money. A beautiful resort, room was good sized and bed was really comfortable. Needs better wifi connection. I could only get a connection when i was outside, and even then it wasn't that great. The Jayakarta, although a little older, is great value for a family holiday. The location is right on the beach in Legian and there is an abundance of affordable beachfront restaurants very close by. The large pools are fantastic for a family, while the beach is only steps away from the rear entrance. The staff were very friendly and helpful, and the buffet breakfast was of a good standard. We are looking forward to staying there again when we are next in Bali. The "Grand 'ol Dame" was a bit tired looking in the residence, but clean and tidy. The pools, restaurants, and especially the staff, were awesome. Our stay was wonderful as usual. Friendly happy staff and excellent communication at this hotel. We got the room we requested which was really great. Excellent value for money and fabulous location. We had a fantastic time at the Jayakarta. The only complaint is the noise from other guest rooms at night ( kids ) other than that I would recommend the motel, I would stay there again, loved it. We found the Jayakarta perfect for its price. The staff were all very friendly. There was a buffet breakfast with a large selection to choose from: eggs, bacon, cereals, pastries, pancakes & Asian foods. The 3 pools were of great size & the grounds were large & immaculate. Our room was clean, big enough & serviced with fresh sheets and towels daily. Bathroom was clean. I would recommend the Cottage view room as this overlooked the pools. Friends booked a different room & ended up right down the back of the resort. The location is perfect, beach right out the front & only a 10 minute walk to JL Padma /Legian shops. There is a great selection of restaurants within walking distance. Our only disappointment was there is no safe in rooms & the wifi was really hit & miss. We thoroughly enjoyed our stay at the Jayakarta. Stayed in a one bedroom apartment. Had a interconnecting room which was good because we went with friends. Even though your not near the main area of the resort/pool, you are not that far away and it was good to be close to the entrance when you bought back all your shopping. The sofa bed was uncomfortable but aren't they all. Great value for money. Central to nice restaurants in the street and along the beach. Great place to stay. Meals not the best but that's not a problem as so many places handy. Reception area could be more informative. Friendly staff. Clean and comfortable. Really great area and great staff. Friendly staff, beautiful resort. Perfect location with the beach and shops. Great pools. Met all your basic needs with convenience to anything you would want. The resort is in a great location, great customer service and the grounds are beautifully maintained. A number of the rooms look a little tired and need an update, but overall a great place to stay and great value for money. My partner and I stayed at the Jayakarta for 6 nights and had a great time! The people are lovely, the pools are excellent and the beach is right outside the hotel. It is in a great location with heaps of great places to eat nearby and you can easily access taxi's. I would highly recommend it to other people. This is an older resort, which we knew. However, we could not fault the service or cleanliness provided. Thank you for a fantastic holiday. The staff were very friendly everyday! We really enjoyed our free breakfast, the food was great and the pools were amazing. I will definitely be recommending this to people I know. So thank you for everything. Neat and tidy rooms and friendly staff. Was my first time in Bali and thoroughly enjoyed the holiday. Always made to feel very welcome. Friendly and so helpful and accommodating. We would never stay anywhere else. Staff were fantastic, location was great, Pools were clean and food was awsome. Look, I don't normally fill these things in but the service we received from travel online has been outstanding. We have used them several times now, dealing with different operators (Rochelle and Annalise) whom both provided us with fantastic service but most importantly provided great packages at the different destinations we have stayed at as well as being quality places at value for money. As I said don't normally fill these surveys out but travel online I cannot highly recommend enough to everyone as they have provided outstanding service to both me and other members of my family every time we use them. Thanks again travel online. Jayakarta Bali is a traditional old fashioned hotel with absolutely beautiful gardens and pools, rooms are clean but could do with a little maintance. Position is fantastic and central to everything and price is value for money. Overall would stay there next time I visit. Such an amazing place! Friendly staff, great location. The staff and location are wonderful. Very clean room and was very happy I got the room I requested. I will stay there again. Very happy. This hotel is in a perfect location on the beach. The hotel is a bit older but very clean and tidy. The grounds are beautifully manicured and the pool is amazing. The hotel has a really nice traditional feel about it. I would definitely stay there again. I had heard a lot of positive and negatives for this hotel. We loved it, great location, clean and fresh towels and sheets. Lovely grounds, gardens and pools. It's not a 5 star but you are not paying 5 star prices. we loved it and will certainly be bringing our kids here. 3rd time stay, 2nd time with the kids. Once again a lovely experience. Very clean, very nice, beautiful pool area, rooms well appointed and clean, everything was almost perfect!!!! It's getting a little tired around the edges but I still highly recommend the Jayakarta. Good security on the street and beach ends of the property, lovely gardens and great pools. Wifi is a bit hit and miss in the rooms but good in open spaces. The whole complex is kept very clean with attentive friendly staff. Great location with Kuta and Seminyak an easy 15 minute stroll along the beach in either direction but with lots of bar/cafe/restaurants within 500 metres. The Jayakarta is right on the beach and such a good all round hotel. We really enjoyed the value for money and yes the place may be a bit dated but service position and value for money is unbelievable. The extras were all well worth it and the breakfast ok ... the free dinner was not great but acceptable. TIP: The Blue Ocean restaurant 150 meters from the beach entrance was the best food we tasted all week and KIKI 1 beach bar just opposite was just $2 a beer for great value. We love the Jayakarta. So close to the beach. The staff were very nice and friendly. The Jayakarta was beautiful. The pools and the manicured grounds and right across the road from the beach. We were even upgraded from standard rooms to deluxe. My only complaint is again, I requested gluten free options at brekky but could only eat eggs/omelet. We have now stayed here 5 times and absolutely love here we love everything about it! All though we are finding it to be increasing in price and proably due for a bit of an up grade we always keep coming back! We are travelling back to Bali in march and have talked about changing resorts! We don't want to it will all come down to price but hopefully will be back again! Great location!!! We had never been to Bali, now having been there, we thought The Jayakarta was just fantastic. It is in a perfect position, lots of restaurants within a couple of minutes walk, it's definitely not 5 star although it has absolutely everything you need and we feel is great value for money. We have stayed here twice now. It is at the Seminyak end of Legian, beach out the front, shops out the back. Walking distance to heaps of good restaurants, so we've never had dinner at the hotel, but the breakfast is fine. Rooms are a little bit tired but clean and pretty much inline with what you pay for, regardless you won't spend much time in them anyway. Will go back to this hotel again. Jayakarta, Super place, highly recomended for a stay in Bali. Book the hotel room, closer to the beach. Pools are lovely, location is great- right on the beach. Rooms are little tired- but very clean and tidy. Was inundated with schoolies which probably affected our stay but was great and enjoyed our time there regardless. We had a great time at this hotel except for the schoolies partying all day & night they had no respect for others . The security were very leniant & staff I definately wouldn't stay this time of the year again but overall the hotel was wonderful . Good value for money, friendly staff, great sunsets, additional services dearer due to additional tax and service charges not calculated on advertised prices.